This is an essay contest! 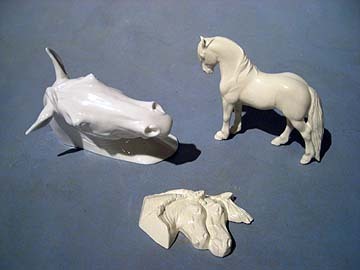 What is it about equine art—created specifically in ceramic—that makes it so appealing and desirable to you? I will be the judge and choose first, second, and third prizes. You MUST sign your full name to your entry in your blog comment, so that I can identify you in order to name the winners! Anonymous comments will not be considered. If your comment goes over 50 words, it will not be judged. 50 words isn’t very many so you will have to really distill your thoughts down to the essence! The prizes are shown in the photo above. I will custom glaze each of these pieces to the winner’s choice of realistic or art glaze color. First Place is the Sarah Rose “Hadrian” mini-scale sculpture cast by Pour Horse. Second Place is the bone china “Boreas” head (which has a hole in the back and can be mounted on a plaque, wall, etc.). Third Place is the Kristina Lucas Francis mare and foal piece (which can be finished as a pin, magnet, or medallion, etc.). I will do the glazing work in January. Deadline for all essays is Friday, December 19th, 12 pm (noon) Mountain Standard Time. All comments made to this blog posting that contain an essay answer posted by noon that day will be considered. I’ll announce the winners in a blog post on Monday, December 22nd. Posting your essay answer in the comments is the ONLY way to enter this contest. Emails will not be accepted. I will delete any rude or offensive comments! I think it will be fun and entertaining to read all the comments… and everyone can read them since they will be public. I would like to also do a “Readers Choice” award from all the essays where you can all vote/choose the winner, but I can’t come up with another bisque prize! I just don’t have anything else in stock. If I find something cool to give away, I’ll announce that contest addition in another posting. Thanks and let the writing begin!